Star Wars Blu-rays to feature THX Media Director optimisation | What Hi-Fi? 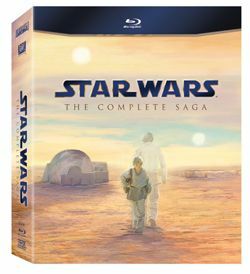 The Star Wars: The Complete Saga, Blu-ray releases - due next week - will be the first to be THX Media Director enabled, which allows for automatically optimised audio and video playback on suitably equipped THX-certified TVs, projectors, Blu-ray players, receivers and speaker packages.
" With THX Media Director, the entertainment experience is finally delivered to your home in a way that faithfully represents the artist’s intent – all without navigating through any menus or pushing any buttons – except 'play' ", explains THX. THX Media Director is, essentially, meta data that's encoded into content and decoded by your home entertainment hardware. THX has also today announced a group of leading chipset partners that will be working with a several major consumer electronics manufacturers to see THX Media Director capabilties built into a range of 2012 home cinema products. We should see a host of new THX Media Director-enabled kit at next January's CES 2012 show, while more THX Media Director-enabled Blu-ray releases are due from Q4 2011.